This seminal lyric from David Bowie's song 'Changes' turns up near the start of John Butler's Handsome Devil, the teen drama which opens the 2017 Glasgow Film Festival. Set in a rugby-mad Irish boarding school, Butler's feelgood drama is about two young men, Ned (Fionn O'Shea) and Conor (Nicholas Galitzine) in fierce conflict with their surroundings, until an inspirational teacher (Andrew Scott) gives them the strength to be themselves. The same Bowie quote opens a classic teen movie, John Hughes' The Breakfast Club, and Butler admits he was very much aware of the reference. Butler's film deliberately blurs the cultural reference points of the era it evokes. 'It's not a period film, but it is firmly based on my own personal experiences,' says Butler. So while visible posters advertise the Boomtown Rats, the film's soundtrack ranges from the Housemartins to the Trashcan Sinatras. Such diverse musical appreciations run against the school's strict ethos, and identifying that conflict helped Galitzine to tackle the role of sports hero Conor. Off-screen, Galatzine is an aspiring musician, a useful talent because a large part of Handsome Devil's charm comes from Conor and Ned attempting to play as a duo for a school talent show ('I wasn't such a fan of 80s music, but John created a great playlist to help me get into character' says Galitzine). Co-star Fionn O'Shea admits he doesn't share Galitzine's gift; 'I really can't sing and I'll never be a pop-star,' O'Shea laughs. But Butler had other plans for O'Shea, dying his hair bright red to imitate David Bowie's spaced-out outsider in The Man Who Fell To Earth. A key early scene in Handsome Devil shows Ned coming a cropper of the school's establishment when he attempts to pass off Lou Reed's lyrics as his own writing. It's a painful moment that smacks of real-life experience, and it's no surprise that it comes from Butler's own schooldays. 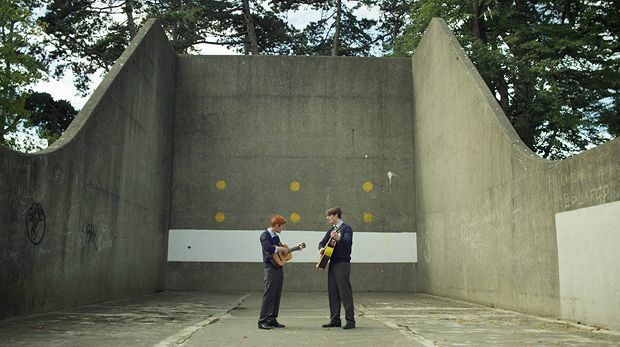 Handsome Devil opens the Glasgow Film Festival on Wed 15 Feb.